dPathology (S.H.K. ), Yonsei University College of Medicine, Seoul, Korea. BACKGROUND AND PURPOSE: Prediction of the isocitrate dehydrogenase 1 (IDH1)-mutation and 1p/19q-codeletion status of World Health Organization grade ll gliomas preoperatively may assist in predicting prognosis and planning treatment strategies. Our aim was to characterize the histogram and texture analyses of apparent diffusion coefficient and fractional anisotropy maps to determine IDH1-mutation and 1p/19q-codeletion status in World Health Organization grade II gliomas. 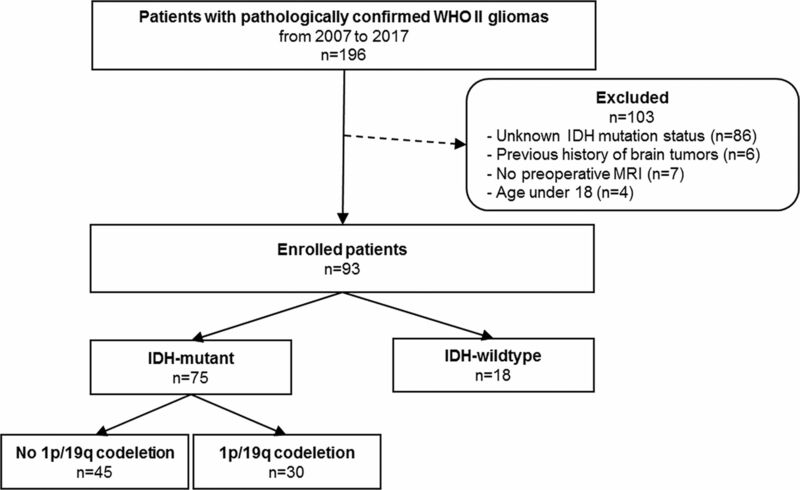 MATERIALS AND METHODS: Ninety-three patients with World Health Organization grade II gliomas with known IDH1-mutation and 1p/19q-codeletion status (18 IDH1 wild-type, 45 IDH1 mutant and no 1p/19q codeletion, 30 IDH1-mutant and 1p/19q codeleted tumors) underwent DTI. ROIs were drawn on every section of the T2-weighted images and transferred to the ADC and the fractional anisotropy maps to derive volume-based data of the entire tumor. Histogram and texture analyses were correlated with the IDH1-mutation and 1p/19q-codeletion status. The predictive powers of imaging features for IDH1 wild-type tumors and 1p/19q-codeletion status in IDH1-mutant subgroups were evaluated using the least absolute shrinkage and selection operator. RESULTS: Various histogram and texture parameters differed significantly according to IDH1-mutation and 1p/19q-codeletion status. The skewness and energy of ADC, 10th and 25th percentiles, and correlation of fractional anisotropy were independent predictors of an IDH1 wild-type in the least absolute shrinkage and selection operator. The area under the receiver operating curve for the prediction model was 0.853. The skewness and cluster shade of ADC, energy, and correlation of fractional anisotropy were independent predictors of a 1p/19q codeletion in IDH1-mutant tumors in the least absolute shrinkage and selection operator. The area under the receiver operating curve was 0.807. CONCLUSIONS: Whole-tumor histogram and texture features of the ADC and fractional anisotropy maps are useful for predicting the IDH1-mutation and 1p/19q-codeletion status in World Health Organization grade II gliomas. The World Health Organization (WHO) classification of gliomas was updated in 2016.1 For the diagnosis of WHO grade II gliomas, the isocitrate dehydrogenase (IDH)-mutation and 1p/19q-codeletion status are used in combination with the histologic phenotype; the genotype takes precedence over the histologic phenotype in discordant cases. The molecular subtypes of WHO grade II gliomas are divided into 3 classes: IDH wild-type, IDH mutant without 1p/19q codeletion, and IDH mutant with 1p/19q-codeletion.1 These molecular subtypes reportedly vary in prognosis and chemosensitivity.2 Patients with grade II astrocytomas and IDH wild-type have significantly poorer prognoses than those with IDH-mutant tumors; the 5-year progression-free survival and overall survival rates are 14% and 51% versus 42% and 93%, respectively.3 Moreover, patients with gliomas with IDH mutations were more sensitive to chemoradiation therapy and had longer survival than those with the IDH wild-type.4 Additionally, 1p/19q codeletion predicts therapeutic response and survival.5 Thus, predicting the IDH-mutation and 1p/19q-codeletion status of WHO grade II gliomas preoperatively may aid in predicting prognosis and planning treatment strategies. To the best of our knowledge, there have been no previous reports that have comprehensively examined the whole-tumor histogram and texture features (ie, ADC and FA parameters), according to the IDH-mutation and 1p/19q-codeletion status of grade II gliomas. This study evaluated the role of histogram and texture analyses of ADC and FA maps based on the entire tumor volume in determining the IDH-mutation and 1p/19q-codeletion status of grade II gliomas, preoperatively. The institutional review board waived the need for obtaining informed patient consent for this retrospective study. Between January 2007 and February 2017, one hundred ninety-six patients with pathologically diagnosed WHO grade II gliomas were included in this study. Inclusion criteria were as follows: 1) WHO grade II gliomas confirmed by histopathology; and 2) patients who underwent preoperative MR imaging, including DTI, with a b-value of 600 s/mm2. Exclusion criteria were the following: 1) an unknown IDH1-mutation status (n = 86), 2) patients with a previous history of brain tumor (n = 6), 3) patients with incomplete MR imaging sequences or suboptimal images (n = 7), and 4) patients younger than18 years of age (n = 4). The flow chart of the study population is shown in the Figure. The mean interval between the MR imaging examination and the operation was 10.73 ± 12.49 days. Preoperative MR imaging was performed with a 3T MR imaging scanner (Achieva; Philips Healthcare, Best, the Netherlands) with an 8-channel sensitivity encoding head coil. The preoperative MR imaging protocol included T1-weighted (TR/TE, 1800–2000/10–15 ms; FOV, 240 mm; section thickness, 5 mm; matrix, 256 × 256), T2-weighted (TR/TE, 2800–3000/80–100 ms; FOV, 240 mm; section thickness, 5 mm; matrix, 256 × 256), and FLAIR (TR/TE, 9000–10,000/110–125 ms; FOV, 240 mm; section thickness, 5 mm; matrix, 256 × 256) sequences. 3D contrast-enhanced T1-weighted images (TR/TE, 6.3–8.3/3.1–4 ms; FOV, 240 mm; section thickness, 1 mm; matrix, 192 × 192) were acquired after administering 0.1 mL/kg of gadolinium-based contrast material (gadobutrol, Gadovist; Bayer Schering Pharma, Berlin, Germany). Whole-brain DTI was performed with b-values of 600 and 0 s/mm2, 32 directions, and the following parameters: TR/TE, 8413.4/77 ms; FOV, 220 mm; section thickness, 2 mm; matrix, 112 × 112; acceleration factor, 2.5; and with an acquisition time of 5 minutes 20 seconds. DTI data were processed off-line with the Medical Image Processing, Analysis, and Visualization software package, Version 7.0 (National Institutes of Health; https://mipav.cit.nih.gov/). T2-weighted images were coregistered to ADC and FA maps using affine transformation with normalized mutual information as a cost function,18,19 and the ROIs were drawn on every tumor section on T2-weighted images using a semiautomatic method, with signal intensity thresholds as previously described.20 The ROIs, were drawn by a single neuroradiologist (Y.W.P) and confirmed by another neuroradiologist (S.S.A.) and were transferred to ADC and FA maps. First-Order Statistics Including Histogram Parameters. ADC and FA histogram parameters consisting of the mean value and SD were calculated from ROIs overlaid on ADC and FA maps. For cumulative ADC and FA histograms, the 10th, 25th, 50th, 75th, and 90th percentile ADC and FA values in the histogram were generated.10 Skewness and kurtosis were also calculated. Second-Order Statistics via Gray Level Co-Occurrence Matrices. Texture analysis via gray level co-occurrence matrices (GLCM) allows extraction of second-order statistical texture features from images.21 Co-occurrence matrix texture considers the relationship between 2 pixels, the reference and neighboring pixel, reflecting local heterogeneity. We used the following parameters for quantitative analysis of the summation of 2D ROIs: contrast, dissimilarity, inverse different moment 1 (IDM1), homogeneity or IDM2, energy, maximum probability, entropy, mean, variance, SD, correlation, cluster shade, and cluster prominence in ADC and FA maps. Altogether, ADC and FA map features were quantified by various features, including their degrees of uniformity (IDM1, homogeneity [IDM2], angular second moment, and energy), heterogeneity (contrast, dissimilarity, variance, and SD), smoothness (correlation), randomness (entropy), and symmetry (cluster shade and prominence). To obtain rotational invariant features, we computed the co-occurrence matrix by averaging >4 uniformly distributed angular directions (0°, 45°, 90°, and 135°). The differences between ADC and FA histogram parameters and IDH1-mutation status were assessed using the Student t test or the Mann-Whitney U test, according to normality test results. Because the number of significant imaging features was relatively large, compared with the number of patients when comparing the IDH1 wild-type and IDH1-mutant groups, we used the regularization method to assess the predictive power of the imaging features based on the least absolute shrinkage and selection operator (LASSO), which reduces the potential risk of overfitting or false discovery. LASSO involves penalizing irrelevant variables to zero and retains only useful features, thereby effectively reducing the number of variables. We used 5-fold cross-validation to find the optimal regularization parameter for LASSO. We estimated the area under the receiver operating curve to assess the predictive ability of variables by selecting significant variables based on LASSO. The 5-fold cross-validated area under the receiver operating curve is the average of the predictive areas under the receiver operating characteristic curve of 5 validation datasets generated by the cross-validation process. The identical process was performed to evaluate correlations between ADC and FA histograms and 1p/19q-codeletion status in the IDH1-mutant subgroup. Statistical analysis was performed using R statistical and computing software (Version 3.3.1; http://www.r-project.org/). Statistical significance was set at P < .05. The characteristics of the 93 enrolled patients with WHO grade II gliomas are summarized in Table 1. Eighteen patients had IDH1 wild-type tumors, 45 had IDH1-mutant without 1p/19q-codeletion tumors, and 30 had IDH1-mutant with 1p/19q-codeletion tumors. Various histogram and texture analyses features differed significantly between the IDH1 wild-type and IDH1-mutant groups (On-line Table 1). Among these factors, 5 were independently associated with predicting the IDH1 mutation based on the LASSO procedure (Table 2). The IDH1 wild-type group had higher skewness and energy of ADC and FA 10th and 25th percentiles, whereas the IDH1-mutant group had a higher FA correlation. The area under the receiver operating curve for the optimal model was 0.853 (95% confidence interval, 0.761–0.945). Various histogram and texture analysis features were significantly different according to the 1p/19q-codeletion status in the IDH1-mutant subgroup (On-line Table 2). Among these factors, 4 were independently associated with predicting the 1p/19q-codeletion status on the basis of the LASSO procedure (Table 3). The 1p/19q-codeletion group had higher ADC skewness and cluster shade, whereas the group without 1p/19q codeletion had higher FA energy and FA correlation. The area under the receiver operating curve for the optimal model was 0.807 (95% confidence interval, 0.649–0.965). Representative cases according to IDH1-mutation and 1p/19q-codeletion status are demonstrated in On-line Fig 1. On-line Fig 2 shows the heat map according to IDH1-mutation and 1p/19q-codeletion status, which reveals the strong relationship between significant histogram and texture features of ADC and FA maps (P < .05) and molecular subtypes. WHO grade II gliomas are heterogeneous at both genetic and histopathologic levels, with intratumoral spatial variation22; we comprehensively analyzed the histogram and texture features of whole tumors using ADC and FA maps according to the molecular subtypes. DTI-based FA values have received attention in the detection of glioma infiltration.30 Previous studies have suggested that tumors with higher FA values have higher tumor cell density and a relatively high Ki-67 index in malignant brain tumors, which indicate greater malignancy potential.30,31 Therefore, the mechanisms underlying lower FAs in WHO grade II gliomas with IDH mutations may involve a lower rate of proliferation and aggressiveness and lower tumor cell densities of these tumors. In our study, various ADC and FA histograms and texture features differed statistically significantly according to IDH1-mutation status; this finding is useful for enhancing the understanding of tumor heterogeneity according to IDH1-mutation status. The IDH1 wild-type group had higher skewness and energy of ADC and 10th and 25th percentiles of FA, whereas the IDH1-mutant group demonstrated higher FA correlation. The energy represents the orderliness of the image; when the image is highly organized, the energy values are high. Correlation is a measure of the linear dependence of gray levels on those of neighboring pixels (ie, local gray-level dependence); higher values can be obtained for similar gray-level regions. Thus, the IDH1 wild-type group demonstrated higher ADC orderliness, whereas the IDH1-mutant group had a higher frequency of similar FA value regions. Few studies have analyzed the texture features of T1 contrast-enhanced or T2 FLAIR images according to the IDH1-mutation status of WHO grade II gliomas32,33; but none performed DTI analyses, which provide insight into the spatial distribution of the tumor cellularity and myelinated fiber tract integrity. In a recent study, diffusion characteristics from visual assessment were significantly different according to the 1p/19q-codeletion status in IDH1-mutant grade II gliomas.34 For further evaluation of the roles of diffusion characteristics in determining the 1p/19q-codeletion status of WHO grade II gliomas, we evaluated histogram and texture features measured quantitatively, which can be more objective. Our results demonstrate that histogram and texture features can be effective for predicting 1p/19q-codeletion status. The 1p/19q-codeletion group demonstrated higher ADC skewness, whereas the 1p/19q-intact group had higher FA energy and FA correlation. Thus, the 1p/19q-codeletion group showed more ADC asymmetry, whereas the 1p/19q-intact group had higher FA organization and more regions with similar FA values. Previous studies showed discrepant results of association between 1p/19q codeletion and ADC and/or FA features in WHO grade II gliomas,24,26,35,36 which may be due to different study groups, smaller sample sizes, and different imaging analyses. Several studies included oligoastrocytic or oligodendroglial tumors based on histopathology, according to the 2007 WHO classification, regardless of IDH-mutation status; then the authors classified them according to 1p/19q codeletion status. Therefore, a small number of patients with IDH wild-type gliomas might have been included. Additionally, previous studies included fewer WHO grade II gliomas with evaluation of focal ROIs of the tumor instead of the entire tumor volume. Because WHO grade II glioma is a heterogeneous tumor with cystic or calcified areas, ADC or FA values calculated in small ROIs cannot represent the cellular density or arrangement of the whole tumor. However, we analyzed tumors according to 1p/19q-codeletion status in an IDH1-mutant subgroup throughout the whole tumor volume, using comprehensive texture analyses. IDH1-mutant with 1p/19q-codeletion tumors showed lower ADC and higher FA values than IDH1-mutant without 1p/19q-codeletion tumors. IDH-mutant with 1p/19q-codeletion tumors are markedly infiltrated by perineuronal satellitosis, with more persistent neurons, as seen on pathology, which may explain their higher FA values.11 If the neurons are spared and the volume of invasion is less, edema should be less, which may explain the lower ADC values in such tumors.11 Calcification is another pathologic finding related to differences in ADC and FA values according to the 1p/19q-codeletion status in IDH1-mutant tumors; microcalcifications are seen in up to 90% of IDH-mutant with 1p/19q codeletion tumors.11 Tumors with calcifications are expected to have lower ADC values, due to lack of water movement in the calcified region. Histogram and texture features of ADC and FA maps of the entire tumor volume differ according to the IDH1-mutation and 1p/19q-codeletion status in WHO grade II gliomas and may be helpful for predicting molecular status. Disclosures: Sung Soo Ahn—RELATED: Grant: This research received funding from the Basic Science Research Program through the National Research Foundation of Korea funded by the Ministry of Science, Information and Communication Technologies, and Future Planning (2017R1D1A1B03030440). * *Money paid to the institution. This work was supported by the Basic Science Research Program through the National Research Foundation of Korea funded by the Ministry of Science, Information and Communication Technologies, and Future Planning (2017R1D1A1B03030440).